talkhealth > Blog > 2013/11 > Comparing gluten free bread – which is the healthiest? Comparing gluten free bread – which is the healthiest? Every wondered just how healthy gluten free bread is and how the different brands compare with each other. They have all improved their fat and calorie content recently but how does it compare to a normal 400g loaf and what’s the difference between the many gluten free loaves now on the market. 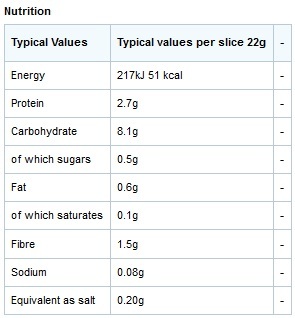 Calories per slice are about a third higher for the gluten free bread. Fat content is also between 7 to 8 times higher in some cases. Fibre is comparable in both wheat containing and gluten free bread. Sugar content is similar or slightly lower in the GF bread. But I stress, this is just a small number of the brands out there, I got tired of trawling for the figures but I may extend the analysis to include own brand breads and some of the other brands too. It’s tricky comparing as they all have stuff in different orders and formats. So what does this mean for coeliacs and wheat intolerant people who eat gluten free bread to replace normal bread? 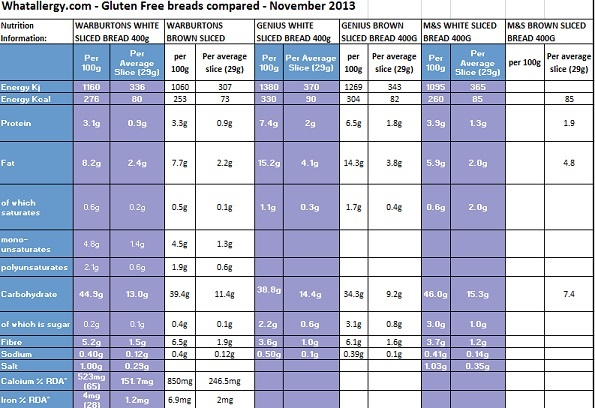 Here is a chart showing the nutritional content for a few brands of the gluten free bread varieties on the market. The figures are sometimes not directly comparable and some contain different information but it’s useful as a comparison. This research has been done using just the internet. For a proper comparison I would like to buy a sample of each and compare availability and price too. Any comments on this would be greatly appreciated. They all compare pretty well in the chart above for salt content. Genius does seem to have a higher fat and calorie content but not by miles. M&S came in the lowest for fat and calorie content but the per slice and 100g calorie levels for all the brands compared don’t seem to always make sense. It does show that there is quite a difference, not just in fat and calories but in fibre and carbohydrates. Warburtons Newburn Bakery brown loaf has the hightest fibre content and are also fortified with calcium and iron. I’m not sure if the others are also but the data was not readily available. Looking at the ingredients of the three brands I’ve chosen to compare here, I do prefer M&S because they don’t use xanthan (xanthum) gum, choosing instead psyllium husk which is a much more natural product, prescribed to aid digestion. Origin: Hydroxypropylmethylcellulose is prepared from cellulose, the main polysaccharide and constituent of wood and all plant structures. Commercially prepared from wood and chemically modified. Function & characteristics: Many different uses, mainly as thickening agent, but also as filler, dietary fibre, anti clumping agent and emulsfier. Similar as cellulose, but better soluble in water. Acceptable Daily Intake: None determined. Side effects: Hydroxypropylmethyl cellulose is quite soluble, and can be fermented in the large intestine. Large concentrations can cause intestinal problems, such as bloating, constipation and diarrhoea. Dietary restrictions: E464 can be consumed by all religious groups, vegans and vegetarians. Ingredients: Water, Starch, Vegetable Oil, Wholegrain Maize Flour, Stabilisers E464, Xanthan Gum, Cellulose Gum, Sugar Beet Fibre, Rice Bran, Egg White Powder, Yeast, Dextrose, Glucose Syrup, Calcium Carbonate, Salt, Maize Grits, Natural Flavouring, Caramelised Sugar, Preservative Calcium Propionate (added to inhibit mould growth), Ferrous Sulphate, Acetic Acid. Ingredients: Water, Cornflour, Potato Starch, Rapeseed Oil, Tapioca Starch, Dried Egg White, Rice Bran, Cellulose, Sugar, Yeast, Stabiliser (Xanthan Gum), Salt, Preservative (Calcium Propionate), Rice Flour. Ingredients: Water, Cornflour, Potato Starch, Rapeseed Oil, Tapioca Starch, Dried Egg White, Rice Bran, Treacle, Yeast, Cellulose, Stabiliser (Xanthan Gum), Sugar Beet Flakes, Salt, Millet Flakes, Preservative (Calcium Propionate). Which is your favourite gluten free bread? I think I prefer M&S purely because it doesn’t contain xanthum gum but I do eat the others too. They are all great toasted and I don’t shop at M&S often. Taste and perforance wise I’m not sure if I do have a favourite. I tend to eat gluten free bread, and other processed foods as a treat. Too much of any processed food seems to take a heavy toll on my immune system so I prefer to eat a naturally freefrom diet most the time which includes very few processed foods, but I think that’s just me. Sensitive soul. We have certainly come a long way since the first gluten free bread I ever tasted, in shrink wrapped plastic bags with long shelf lives and which didn’t brown unless toasted about 3-4 times. One day soon someone will come up with a revolutionary way of getting better bread with healthier ingredients, but for the time being, this is the best we have and it’s pretty good. Baking witout gluten requires higher fat content in order for the grains to bind together so it is probably unfair to compare a 400g wholemeal loaf with these three gluten free alternatives but it’s a start. Or do you prefer to make your own? Do you eat less gluten free freefrom processed foods because of the higher calorie and fat content? One Response to Comparing gluten free bread – which is the healthiest? Hi, I get Genius bread on prescription, (good bread, no probs at all with it) Just for a change I bought some Warburton gluten free farmhouse seeded, oh dear won’t buy anymore,did I get a bad batch or what, TASTELESS!!. Anyone else tried any? ?